If you think Chekhov is too posh or too miserable for you then think again. If you think that portraying family conflict and social unrest is old hat, look out the window. Uncle Vanya’s power to amuse and appal us continues. 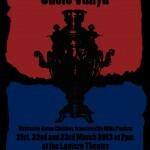 Buy your tickets online at : www.thelanterntheatre.co.uk, or reserve via phone on 0151 703 0000. Prices: £7 full, £5 concessions (students, OAPs, receiving benefits etc). This is the story of 9 members of an extended family living on a country estate in 1890s Russia. They are struggling to come to terms with their own identities and the loss of social role, having regrets for the loves they never had and ambitions they never realised. Chekhov’s tale of the country is not idyllic and the family it portrays is decidedly modern, in spite of the Imperial Russian setting. From financial struggle, social change and environmental danger the play tackles themes and issues which are relevant even today more than 100 years on.